Located in the west of Zhejiang Province in the upper reaches of the Qiantang River, Quzhou has long been known as the thoroughfare to the four provinces, namely Zhejiang, Fujian, Jiangxi and Anhui. Covering an area of 8,844 square kilometers,it has a county-level city - Jiangshan, two districts - Kecheng and Qujiang as well as three counties - Longyou, Kaihua and Changshan, with a total population of 2.58 million people. As a nationally renowned historic and cultural city, Quzhou was built in Eastern Han Dynasty (AD 25-220). It was one of the best-persevered state-level cities in ancient times in Jiangnan (area south of the Yangtze River), and cultural relics (units) under state protection, which can be proved by its rebuilding of Wenchang pavilion and Tianwang pagoda. Considered as the dwelling place of Confucius’s descendant in South China, Quzhou has Confucius' South Zen Ancestral Temple, one of the only two Confucius ancestral temples in China. The Qingyang village in Jiangshan, Quzhou’s county-level city, is acknowledged as the Chairman Mao Zedong’s ancestral home by National Archives Administration of China. Quzhou’s Lanke Mountain is the legendary birthplace of Weiqi (the game of go). Known as the thoroughfare to the four provinces, namely Zhejiang, Fujian, Jiangxi and Anhui, Quzhou enjoys convenient transportation in aviation, railway, expressway and shipping. Four railways pass through Quzhou, including Hangzhou-Zhuzhou railway, Shanghai-Kunming high-speed railway, Jiujiang-Jingdezhen-Quzhou railway, as well as the Quzhou-Ningde railway (under construction). The Hangzhou-Quzhou high-speed railway is going to start construction, and once it is completed, it will take only 40 minutes from Quzhou to Hangzhou. There are four expressways crossing the city, namely Hangzhou-Jinhua-Quzhou expressway, Hangzhou-Xinanjiang-Jingdezhen expressway, Huangshan-Quzhou-Nanping expressway, Longyou-Lishui-Wenzhou expressway. The Quzhou airport has opened flights to Beijing, Shenzhen, Xiamen, Qingdao and Kunming. The Qujiang shipping routes is soon going to start operation. 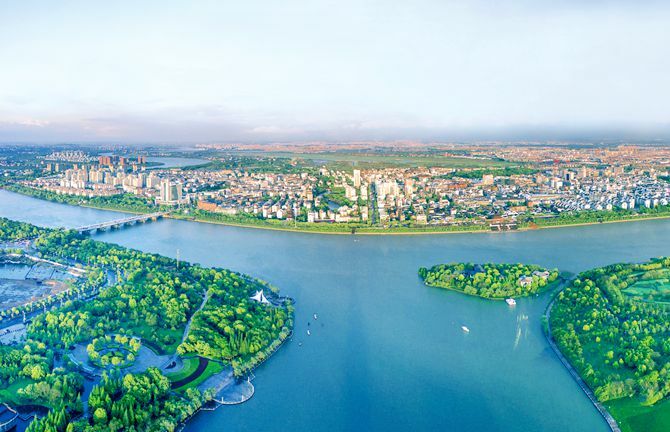 Quzhou has the honorary titles of state-level ecological demonstration zone, national garden city and national forest city. Its forest coverage rate has reached 71.5 percent. It received its title as the "Top Ten livable city in China" for consecutive two years and ranked fourth on the list of "China’s Happy City". As one of the first national leisure area, Quzhou is surrounded by Yellow Mountain, Sanqing Mountain, Wuyi Mountain, Qiandao River. It also has Jianglang Mountain, a provincial-level tourist resort, Qianjiangyuan national park and Longyou Grottos, which has been reputed as an enigma through the ages.